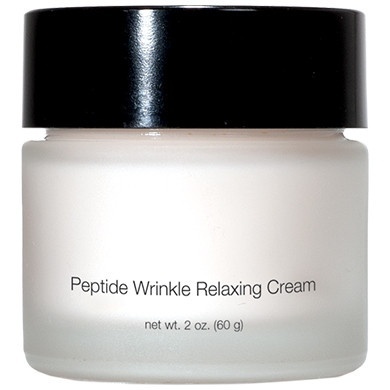 Skincare Peptide Wrinkle Relaxing Cream - Carol Thompson Images, Inc.
What It Is Rich, moisturizing cream helps prevent collagen and elastin breakdown for firmer, more resilient skin. Advanced peptides help reduce wrinkle depth and improve skin tone. Paraben-free. What's Inside Matrixyl® Synthe’6™ Mimetic Peptide works to improve underlying skin structure, while performing the function of a “chaperone” molecule. Similar to constructing a building where a project manager coordinates the various jobs, this molecule is involved in the orderly, rapid maturation of collagen. Squalane & Glycerin are effective emollients that prevent transepidermal water loss (TEWL), keeping skin moist and supple. Dermal Filler Cross-linked Hyaluronic Acid helps restore volume, smoothing out skin’s microrelief. Vitamin E provides antioxidant protection against environmental assaults. Macadamia Seed, Hazel Nut and Cucumber Oil are nurturing oils rich in fatty acids and other nutrients. How To Use PM. Apply nightly to cleansed face and neck, massaging gently using upward strokes. Water (Aqua), Squalane, Hydrogenated Vegetable Oil, Stearic Acid, Polysorbate 60, Cetearyl Alcohol, Ethylhexyl Palmitate, Dimethicone, Butylene Glycol, Glycerin, Cetyl Alcohol, Magnesium Aluminum Silicate, Macadamia Ternifolia Seed Oil, Corylus Avellana (Hazel) Seed Oil, Cucumis Sativus (Cucumber) Seed Oil, Sodium Hyaluronate Crosspolymer, Palmitoyl Tripeptide-38, Acetyl Dipeptide-1 Cetyl Ester, Tocopheryl Acetate, Ethylhexylglycerin, Hydroxypropyl Cyclodextrin, Polysorbate 20, Laureth-3, Hydroxyethylcellulose, 1,2-Hexanediol, Caprylyl Glycol, Sodium Hydroxide, Disodium EDTA, Phenoxyethanol.